Eric Henry Liddell achieved international renown as an Olympic gold medalist, as an avid rugby player, and as a person totally devoted to his faith in Jesus Christ. Liddell was born in 1902 in China, the second son of missionary parents. At the age of six he was sent with his older brother to Eltham College, Blackheath, a boarding school for the children of missionaries. Liddell remained there until he enrolled in Edinburgh University. Liddell excelled in athletics throughout his educational career. Liddell won a position on the British track and field team for the Paris Olympic games of 1924. Liddell won the gold in the 400 meter, setting a world record, and a bronze in the 200 meter. His best event as a university athlete was the 100 meter and he was highly favored to win gold in the Olympics. Liddell, however, chose not to run the 100 meter because the heat was to be held on Sunday. He chose not to break his personal commitment to keeping a weekly sabbath even if that meant not running in his best event in the Olympics. The award-winning film, Chariots of Fire, is the story of Eric Liddell and his participation in Olympiad VIII. After his graduation from Edinburgh, Liddell returned to North China, near his birthplace, and served as a missionary from 1925-1943. He was ordained in 1932 and in 1934 married Florence Mackenzie, the daughter of Canadian missionaries to China. Together they had three daughters. Because of ongoing conflict between China and Japan in the 1930’s, Liddell and his family endured significant hardships. In 1941, after the Japanese invasion of Pearl Harbor, the British government advised expatriates to leave the country. Florence Liddell took the children and fled to Canada. Eric Liddell and his brother Rob stayed on and continued their work. In 1943, Liddell was interned in the Japanese concentration camp at Weihsein. Having won the respect of his captors, Liddell is remembered by camp survivors for his ministry among them. He died in 1945 shortly before the camp’s liberation. 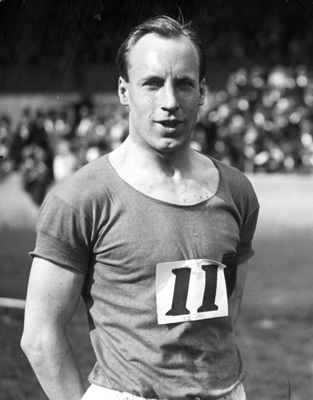 I God whose strength bears us up as on mighty wings: We rejoice in remembering thy athlete and missionary, Eric Liddell, to whom thou didst bestow courage and resolution in contest and in captivity; and we pray that we also may run with endurance the race that is set before us and persevere in patient witness, until we wear that crown of victory won for us by Jesus our Savior; who with thee and the Holy Spirit liveth and reigneth, one God, for ever and ever. Amen. II God whose strength bears us up as on mighty wings: We rejoice in remembering your athlete and missionary, Eric Liddell, to whom you gave courage and resolution in contest and in captivity; and we pray that we also may run with endurance the race set before us and persevere in patient witness, until we wear that crown of victory won for us by Jesus our Savior; who with you and the Holy Spirit lives and reigns, one God, for ever and ever. Amen. Text from Holy Women, Holy Men: Celebrating the Saints © 2010 by The Church Pension Fund. Used by permission. Readings. Psalm and Hebrew reading refer to being sure-footed like a deer and to run and not be weary. OK, he was a track and field star – but this seems a stretch. Maybe we should have gone the whole route and ‘run the race that is set before us”, too. Just how cutesy can the readings be? Bio. Nice ‘who he is’, ‘why he is important’ statement; and, ‘He died in 1943.’statement.s. Deo gracias. The bio doesn’t say, but I assume his ordination was C of E? Nope, that would be the Church of Scotland, aka the Presbyterian Church on this side of the pond..
“Weekly” sabbath? As opposed to what, a monthly or annual one? “Sabbath” means ‘seven,” and is by definition weekly. After the 1924 Olympics, Liddell remained in Scotland for one year of training for ministry and missionary work at the Scottish Congregational College in Edinburgh. He went back to China before graduation. And I agree about the pronunciation. Jeremiah’s comment expresses my reaction on reading the commemoration. Michael, — sorry but I’m on the run today. There will be other collects! Re the ordination question — I had the same question as Cynthia Gilliatt on my first reading of the bio. For clarity’s sake, it should read: “In 1932, he was ordained in the ______________ Church and in 1934…” once the full research has been done to confirm which denomination ordained him. The biography seems rather unbalanced. There is a great emphasis on Eric Liddel’s achievements in track and rugby. Yet his inclusion in HWHM is based upon his selfless work in China. Apparently Eric Liddel died of a brain tumor while interned. I wonder how much malnutrition and deprivation played a role as well. I just want to say I think Suzanne’s 3rd paragraph information is extremely important and should be included. Her opening observations about the sports/ministry balance in the write-up and collect (and Michael’s about the readings) are worth taking into account, also. And although addressed by others, we need to acknowledge what church those commemorated belong with, are ordained in, etc. Otherwise it looks like we’re trying to pass them off as Anglicans/Episcopalians. Am I the only one who suspects that without the movie, Liddell would not have been included in HWHM? Were there no Episcopal or Anglican Missionaries interned by the Japanese? Liddell is one of the weakest candidates for inclusion in our calendar. _Chariots of Fire_ (1981) is one of my top two or three movies. I would never have heard of Liddell otherwise, although this bio would have piqued my curiosity. Every once in a while a popular movie (like _Amazing Grace_ ) gets important Christian ideas across in the context of the implementation of those ideas and values in the lives of people who lived after Biblical times. The fact that those movies (and books and TV shows) are somewhat rare makes the SCLM calendar expansion especially useful in the church today, I think. “Chariots of Fire” played a bit fast and loose with the facts. The scheduling of the Sunday heat waa known to Liddell before he even embarked for France. It was not a shock out of the blue, as I understand it was portreyed in the movie, which I haven’t seen. Fanatical Sabbatrrianism [is that a word? I bet I didn’t spell it right] is not usually associated with Anglicans. I remember a murder mystery set in England in the 20s, in which the vicar is described as taking an extra glass of sherry before Sunday lunch, so as to be in properly elevated spirits, to honor the day. And yes that’s a bad pun. What the movie made clear was that his faith was not compromised by pressure on him to give up a principle (keeping the sabbath)–as well as his missionary work and what he gave up in order to do it, as well as giving up his life as mentioned above. The movie made all that very clear. Many years later I learned that parishioners of ours from England knew the director of the movie (he was in their class in grade school). That’s irrelevant, I suppose, but the movie did make me want to find out more about Liddell’s life, and I did. It did a good job of showing what he stood for. Does the fact that someone’s life appeals to a movie maker disqualify that person? –Perhaps someone can tell us about Episcopal or Anglican missionaries equally moved by principle, or perhaps did much more than Liddell. Most saintly acts, probably, go unnoticed by posterity. Does that mean we shouldn’t commemorate those which are noticed? Correction: the movie did not make clear about his giving up his life. I hope the bio will. Well, since the person pressuring him was an Anglican (the Prince of Wales), does that help? I’ve known his story for a long time and have retold it in sermons several times. I agree that more info about his death would be useful. The first paragraph has the “headline writer”at work again, telling the high points up front, instead of following a logical order. It should be totally eliminated. Line 3, second paragraph: add “, London” after “Blackheath”. Lines 2, 3, 4, & 5, third paragraph: amend “meter” to read “metres”.